Petie the Pony may be short in stature, but he’s sure long on endurance. This amazing miniature pony mix spent more than 90 hours last year providing his own special brand of medicine – making bedside visits with hospitalized children. Petie, 21, hails from Victory Gallop, a therapeutic riding center in Bath Township. He undergoes hours of preparation to ensure proper sterilization before he walks the halls of Akron Children’s Hospital. 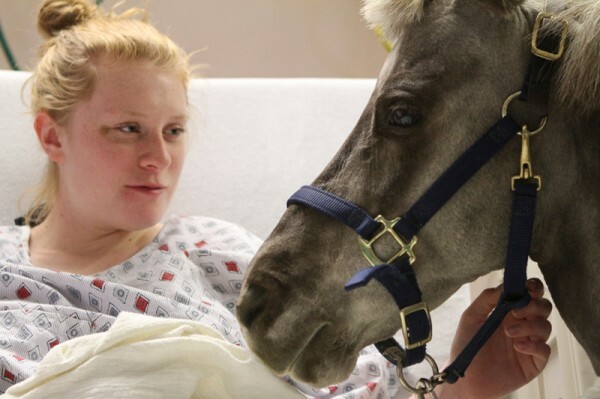 Petie has been visiting our patients since 1997, and 2012 was a banner year for him, according to Victory Gallop. 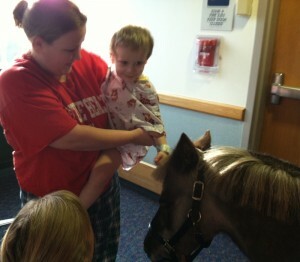 2-year-old Ryan Schwartz of Akron was intrigued with Petie the Pony, as long as his mom, Holli, held him tight during the visit. He visited between 10-15 children every couple of weeks from May through October. That’s about 360 children who received “Petie care” last year. This year Petie started visiting patients in the winter, too, which means he’ll log even more time in 2013. 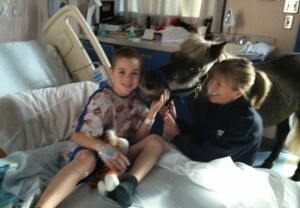 Kendall Steer, of Cuyahoga Falls, was glad to have an equine visitor today. As Petie’s handlers chatted with Kendall, her parents remarked that Petie offered a fun diversion from her recent surgery to remove her appendix. Emily Selders’ mom made sure to get a picture of the encounter with Petie. She didn’t think her son, who was at school at the time, would believe a pony came to visit Emily without some photographic evidence. Derek Evans, 9, was very pleased to see Petie, as he has two horses at his home in Medina. He chatted with Victory Gallop Co-Director Kim Gustely, telling her he plans to show his horses and is a 4-H Club member. And it isn’t just the patients who benefit from his presence. The staff at Akron Children’s Hospital loves Petie, too. Today, the doctors rounding on the patient floor snapped pictures of him with their phones, patted him on the head as they passed, and sent many kind words his way. We are so thankful to Petie and the people who tirelessly work to make him available to our patients and staff. Learn more about Petie and Victory Gallop by liking them on Facebook.